If you were planning to sell your diesel Jetta any time soon, you might want to hold off. Resale values are going to take a hit in the wake of the company's emission scandal. In a worst-case scenario, resale prices might decline 3% to 8%, said Eric Ibara, senior residual value analyst at price tracker KBB.com. But he's not sure that prices will be hurt even that much since there is no safety risk to owners. Sales data show that for the most part consumers don't pay a lot of attention to recalls when they make buying decisions. In fact, millions of used cars are sold every year which have open recalls that have not been repaired. 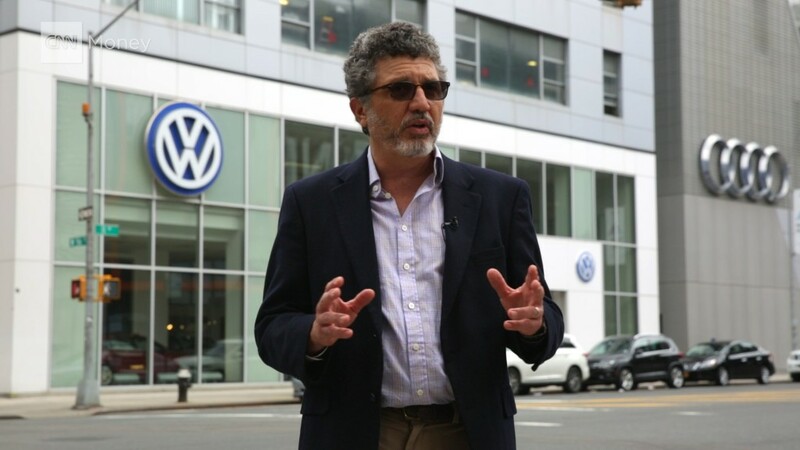 But Volkswagen (VLKAY) violated consumers' trust when it put software in its diesel cars to trick emission testers into concluding its cars were cleaner than they really are. And that's a more serious problem, according to Ibara. "I think the larger threat to Volkswagen prices is to its reputation," he said. "It's a German manufacturer with an excellent reputation for engineering. That's now been tarnished." Anil Goyal, vice president of automotive valuation for Black Book, agrees. "What suffers the most are the brand and the sales of new vehicles," he said. Volkswagen has halted sales of the affected models - the diesel versions of the Passat, Beetle, Jetta, Golf and Audi A3 - while it determines how to fix the problem. The uncertainty about what will happen next will also ding prices. "If an affected diesel owner must trade in the vehicle in the short term, they can expect a lower value because of the additional short-term risk incurred by the dealer. Like everyone else, dealers are waiting on news of the fix from VW," said Jessica Caldwell, an analyst at Edmunds.com. Still. the hit to prices will probably measured in the hundreds, rather than thousands of dollars. In 2012, Toyota (TM) agreed to compensate owners who sold cars that were recalled for unintended acceleration. Owners got an average of $472.59, but only if they sold during the period between September of 2009 thru December of 2010, when data showed values had been diminished.